A high-performance exhaust system helps your car perform correctly in more ways than you may realize, regardless of whether it has a stock or aftermarket exhaust system. Your car's performance exhaust system keeps the engine running correctly and toxic exhaust fumes from entering the interior. High-performance exhaust systems provide your vehicle with the best possible fuel efficiency while also reducing harmful exhaust emissions that pollute the air. Other functions of performance exhaust systems for cars include reducing the temperatures of the exhaust and muting engine noises. 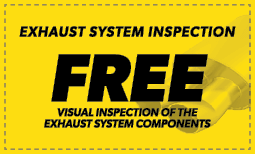 Make sure to stop by Meineke #1837 in Fargo, ND, right away if you suspect your exhaust system has a problem. Exhaust systems experience a lot of wear and can develop leaks and cracks. Keeping track of the state of your muffler is important to your car's function and your safety. If you want your car to run smoothly and protect you from carbon monoxide poisoning, check on your car muffler. If your average miles per gallon are going down, the car is sounding louder, or a bad odor is coming from the car, you should stop by a muffler shop to get it repaired or have it replaced with a performance exhaust system. We'll perform all inspections, maintenance, and replacements needed at Meineke #1837 in Fargo, ND. Corrosion is one of the biggest problems facing your exhaust system. When moisture sits in the system, it can react with the metals of the pipes and cause them to rust. Over time, this rusting can cause breaks to form in the pipes which will leak gases and affect the performance of your vehicle. If you drive more than 15 miles at a time on a regular basis, you may consider equipping your vehicle with the stainless steel pipes that are part of a high performance exhaust system instead of those made with traditional steel, to eliminate the problem. Contact Meineke #1837 in Fargo, ND, for information on pricing. Exhaust systems do eventually wear out. The combustion process inside of your engine creates a tremendous amount of heat. This forces chemical changes to occur. While much of your fuel is burned up, one of the remaining byproducts is water vapor. This vapor comes into contact with the metals causing oxidation and rust. Eventually the metals of your manifold, pipes, and car muffler wear out. They develop cracks and weak spots. You may hear loud engine noises or notice an odor as you drive. Fixing the problem may require an aftermarket exhaust or even a custom exhaust system to be installed. If you are experiencing any of these warning signs, contact our in Fargo ND, and have your vehicle inspected. A car muffler is a very important component of your vehicle. When it needs to be serviced or replaced, you should bring your vehicle to Meineke #1837. We know that time and muffler repair cost are important concerns, which is why our muffler shop is committed to making this a win-win situation for both you and your vehicle. Our affordable and wide selection of high performance exhaust systems, certified, knowledgeable and professional technicians and low prices make it easy for you to get your vehicle serviced by the best performance exhaust system experts in Fargo, ND. 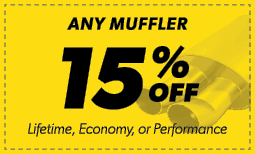 Bring your vehicle into one of our many locations for a muffler inspection and performance exhaust estimate.